The Captain Test: the final evaluation to be faced by cadets leaving Spacefleet Academy and hoping to join the Spacefleet Operational Service. A simulation that gauges recruits' resolve, command aptitude, combat abilities, diplomatic acumen and courage under pressure. The test that will determine if you have what it takes to become a Space Hero, or if you'll wind up just another terrestrial nobody, looking up at the stars and dreaming of glories that might have been. It won't be easy. 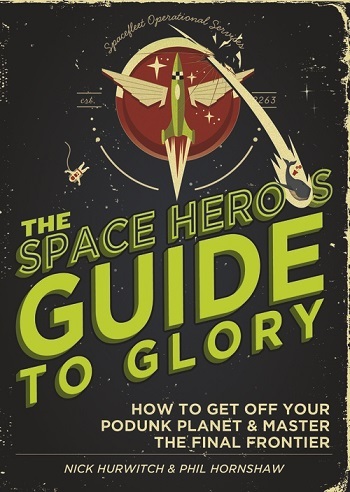 Space Heroism takes guts. Gumption. Leadership. Force of will. Aim. A tenuous grasp of language. Hair product. After four years in Spacefleet Academy, it's time for you to face the Captain Test and Spacefleet's greatest hero: Captain Dirk Parsec, your evaluating officer. You've trained for this. You're ready. You hope you won't die horribly in the testing simulator, but you probably will. Step onto the simulated bridge of the Kobayanshi, Cadet. Your Spacetime is now. Kobayanshi Marooned is an original Twine comedy story based on The Space Hero's Guide to Glory: How to Get Off Your Podunk Planet and Master the Final Frontier by Nick Hurwitch and Phil Hornshaw. It's a story about one thing: survival. Also about space diplomacy. Oh, and cloak-and-dagger spy stuff. And, of course, lasers. Nearly 30,000 words of PURE SPACE ADVENTURE! 26 possible endings, most of which feature the player dying horribly or somewhat horribly! Diplomacy, combat rolls, strange alien seductions, lasers, and mini-pizzas! Aliens! Humans! Several non-descript characters! Branching plots filled with CHOICES that have MEANING! Absolutely no themes of any kind! If you like the game, check out the book at http://spaceherosguide.com. Content Warning: Violence and awful Space deaths by way of vacuum, vivisection, and various types of dismemberment and explosions are discussed -- but, you know, in a funny way.